This is the essential oil deployment survival kit I recently sent off to sea with my husband. He’s on a submarine, so he doesn’t have much space! Each item in the kit is there for a reason, and they’re all oils I know he likes and uses. I’ve already gotten emails about how one oil or another came in handy! Even though I designed this kit for my husband to take on deployment, it would also make a great present for loved ones left at home. 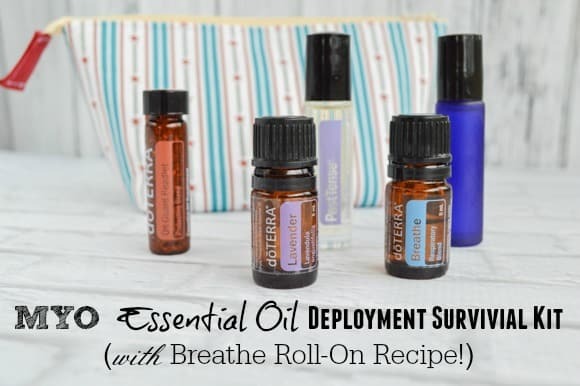 Whether your loved one is headed off for deployment or just a busy day at work, I hope these suggestions for an essential oil survival kit help you out! And they’re all packaged up in a nice, padded zipper bag I made him! He was actually the inspiration for my entire line of zippered essential oil carrying cases, which are currently top sellers in my Etsy store. Update: Sorry, everyone! I’m not making these any more. Several months ago, my husband and I started using lavender essential oil at night. We both love the way it smells and, hey, it’s supposed to be relaxing and all that! And, quite honestly, I had a small ulterior motive – I wanted to create an easy to replicate bedtime ritual he could take with him on the submarine. A couple weeks later when he had to go underway, I filled up a little sample-sized bottle with lavender and explained that I was giving it to him so he could use it each night and think of home. He took it and actually used it! What a great guy. If I forget to give him some lavender when he’s at home, he reminds me and asks for it, which is pretty cool. Lavender has become part of how we stay connected, even when he’s underway or on deployment. Using it at night is a shared ritual that we can still both do, even when apart. I did not send an entire bottle of lavender to sea with Papi Chulo. He only uses a little each night, and has very limited space. Instead, I used a plastic pipet to fill up a 1 ml (1/4 dram) sample bottle for him. I also use these little bottles when I’m traveling, so buying a 12 pack of sample bottles on Amazon was worth it, even though I’ve never once handed a sample to anyone! The submarine has a bunch of guys all crammed up in each other’s business. Constantly. Whenever they head out to sea from time in port, someone will end up bringing a cold or something on board, then basically everyone gets sick. During their last major pre-deployment underway, Papi Chulo wrote and told me all about how he didn’t get sick and everyone else did. This time he did manage to catch something, but says he was better in less than 24 hours. 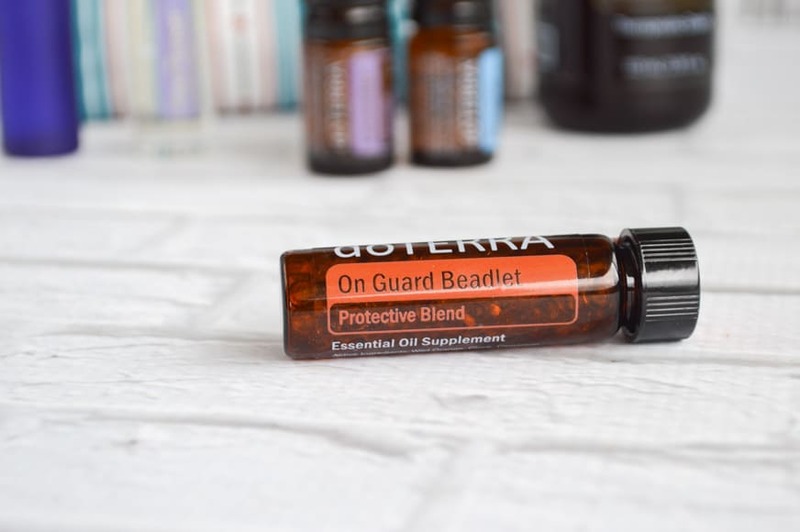 The OnGuard Beadlets are way more convenient for him than a bottle of the essential oil plus carrier oil, and he can easily slip the container in his pocket. I like the way OnGuard smells, but research shows it’s actually useful, too! PastTense is the one oil I threw in there that he didn’t already know and use. Being on deployment is, understandably, pretty stressful at times, so I thought it would be a good fit! Plus it has lavender, which he did already like. 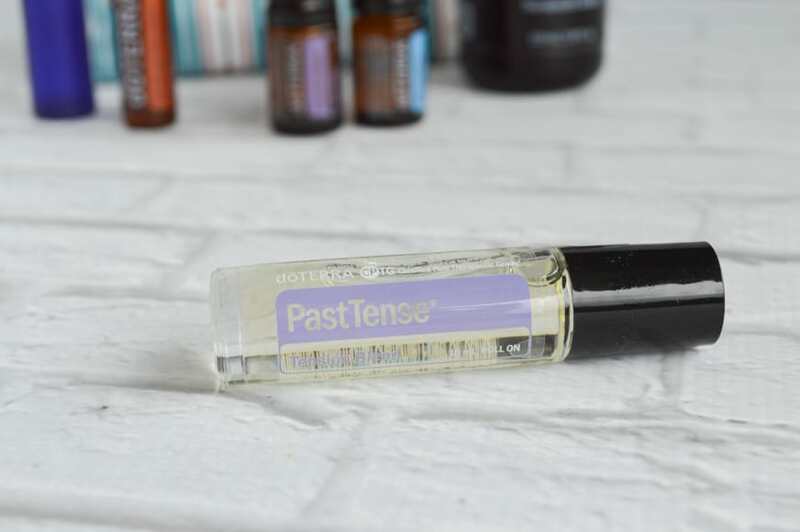 I’ve learned that PastTense best used sparingly, especially when you put it on your temples, but I liked using it before he took it on board. I know he was using it at work before they even left port, so I think it was a good choice. Shortly after getting home from that first with-lavender underway, Papi Chulo woke up super contested. I put some Breathe on his chest with fractured coconut oil and he loved it instantly. 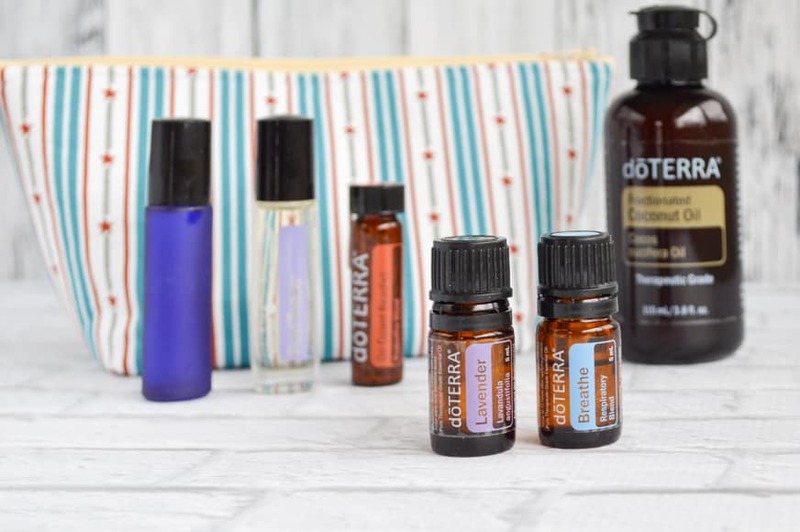 You can be a giant essential oil skeptic (and there are plenty of times when I think “I’m not so sure about that…” when reading some EO claims! ), but trying Breathe will make you a (Breathe) believer. It’s a little strong for neat (undiluted) topical application, though, so I could just send a bottle of it along with him on the submarine without also packing a bottle of coconut oil, and he just doesn’t have that much space! That’s why I decided to make him a Breathe roll on, instead. It’s compact, easy to use, and he loves it. Papi Chulo actually kept this one at home on his nightstand until the day before they left port because he wanted to keep it handy. Sucess! Pull the top off your roller bottle, if necessary. If you’re having trouble, wrap the plastic part that holds the roller in place with a folded-over paper towel or piece of t-shirt, then grab on to it with a pair of pliers. Don’t just take the bare pliers to the plastic, though, or you’ll gouge it! Add 8-12 drops of Breathe to your roller bottle. I use 10. Twelve would be pretty strong, and eight a little less intense. It’s up to you! 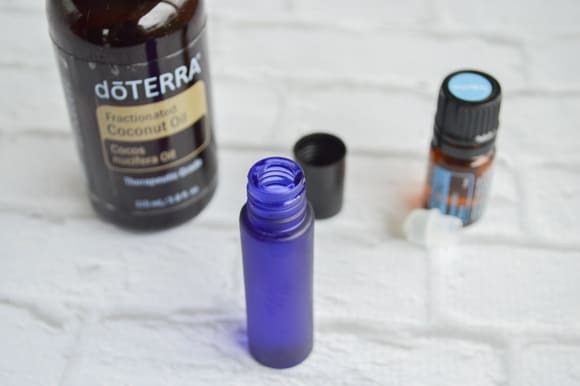 Fill up the rest of the bottle with fractured coconut oil, or your dilution oil of choice. Give the bottle a quick shake before each use and apply away! It is best used on your chest or around you collar bone. Please don’t get it in your eyes, mouth, or nose! 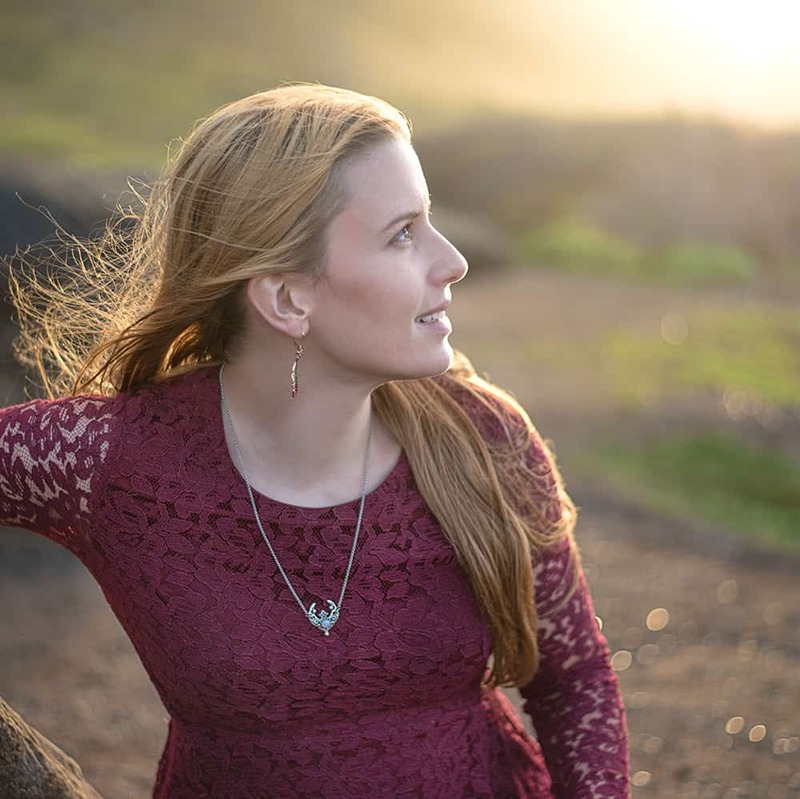 If you’ve visited my blog before, you may recall that making it more personal was one of my goals for 2015. One of the ways I plan to do this is by blogging about our various deployment survival strategies and how we stay connected while he’s at sea. This is our second deployment together, so I think I have a few useful things to share! I’ll also write about “half way night” box ideas, pre-planned things families put together for the guys to take along, and various strategies for making it through deployment safe and sane. Hello, For the Breathe rollerbottle, us it a 10ml bottle? Thank you! Yes, I used the 10mL roller bottles I linked in the post. =) Thanks for stopping by! What a thoughtful wife you are! Interesting info about the essential oils. I love your essential oil pouches, and am so happy for your sales! !